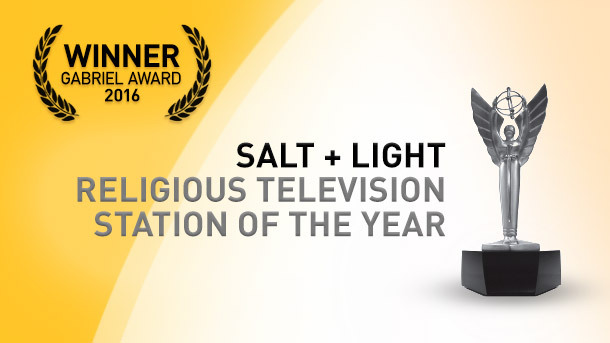 On Thursday, June 2, 2016 Salt + Light Television will be presented with its sixth Gabriel Award for Religious Television Station of the Year at the 51st Catholic Media Conference in St. Louis, Missouri. Salt + Light Television is Canada’s only national, award-winning Catholic television network that offers a variety of programs, live event coverage, series, documentaries and other hope-filled content. The network is available on various cable and satellite carriers in Canada and throughout the world via online streaming, on-demand videos, various Social Media platforms and a yearly magazine. "I accept this honor once again for Salt and Light Catholic Media Foundation Network as a tribute to our late founder, Gaetano Gagliano, who left us at the age of 99 this past spring,” said Fr. Thomas Rosica, CSB, CEO of Salt and Light Catholic Media Foundation. “His bold, visionary leadership enabled and enobled us to offer the flavor of the Gospel and the light of Christ to Canada and far beyond over the past 14 years. On behalf of our entire staff, I thank the Catholic Academy for this award as we pray in gratitude for Gaetano Gagliano's vision of Catholic Media as a privileged instrument of the new Evangelization." Since 1965, the Catholic Academy of Communications Professionals has honoured works of excellence in film, television and radio programs. The Catholic Academy addresses commercial and religious broadcasters, producers, and filmmakers to produce films and programs that serve and enrich the community. Born on the wings of World Youth Day 2002 in Canada, Salt + Light is a unique instrument of the New Evangelization. It is dedicated to being, and helping others become, the salt of the earth and the light of the world. The mission of Salt +Light is to proclaim Jesus Christ and the joy of the Gospel to the world by telling stories of hope that bring people closer to Christ and the Catholic faith.